One week after Israeli soldiers shot and killed a resident at the Al Hamra Roadblock, near the northern West Bank city of Nablus; soldiers shot and killed another man on the same roadblock on Saturday. The latest casualty was identified as Khaldoun Sammoudi, 25, from Al-Yamoun village near Jenin, the Maan News Agency reported. An Israeli military spokesperson stated that the man was in a taxi that approached the roadblock before he stepped out and started walking fast towards the soldiers “while shouting Allah Akbar and carrying a suspicious object”. The spokesperson added that the man refused to heed to soldiers demands to stop, “so they followed operational procedures and opened fire at him”. The army then declared the area a closed military zone and ordered the ambulances at least 300 meters away. It remains unclear whether the man died instantly or bled to death as medics were not allowed to reach him until later on. The army spokesperson claimed that sappers found an explosive device and a knife on the body of Sammoudi. He added that the soldiers suspected the man carried an explosive device as, according to him, “all passengers who were in the taxi fled the scene directly after Sammoudi left it”. Maan reported that an eyewitness told its correspondent that Sammoudi stepped out of the taxi in a hurry and rushed towards the roadblock, and added that some of the soldiers even ran away from the roadblock while another soldier ordered Sammoudi to step then opened fire at him. After Sammoudi was shot, soldiers removed his clothes, and left him to bleed to death. Following the incident, soldiers violently attacked a Palestinian man who works as a guard at a nearby park. The man was identified as Amir Al Kharraz. On Sunday morning last week, soldiers stationed at the Al Hamra shot and killed a Palestinian youth despite having his hands up following their demands. 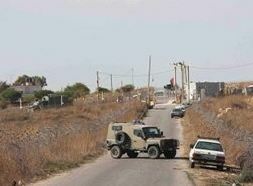 The Palestinian Red Crescent reported that slain resident was identified as Mahmoud Mohammad Daraghma, 21. The Red Crescent added that Daraghma was shot in his chest and buttocks while walking towards the roadblock. Dr. Hatem Farroukh, who witnessed the shooting, said that Daraghma had both of his hand over his head before two soldiers, male and female, shot him from a distance that does not exceed three meters. Daraghma was not armed and only had a Coke can in his hand, and that just before he was shot, he was walking next to some female soldiers. The soldiers then opened fire at him from different directions.